The essay outline is the most important step in writing the essay. Why? It allows you to set up and see exactly how your essay should proceed. Different types of essays have different purposes, so figuring out how each should look can be difficult. However, when you craft an outline, you can examine exactly what is going on with your subject and determine the order in which you will give information to your reader. In this article we’ll give you everything you need to know to write a great outline. An outline represents the structure of your essay in a bare bones format. It is like a blueprint of a house that tells the builder where everything should go. Writers use an outline to stay focused, on track, and on point. Writing the outline should be easy. Start with a title: give your paper a clear sense of purpose and direction by creating a meaningful title. Go to the introduction: this is where you tell the reader what your essay will be all about. Start your introduction with a hook and end it with a thesis statement that explicitly states what your paper will do. In between the hook and the thesis, supply a little background info to get the ideas rolling. There are many types of essay outlines because there are many types of essays. As Purdue OWL, there are four main modes of discourse: Exposition, Description, Narration, and Argumentation. Each mode has its own unique structure. Therefore, each outline for each mode will differ significantly. Let’s look at some examples to help clarify this point. An argumentative essay is based on research and should convince the reader of specific point, supported by evidence. The introduction portion of the outline is important because it sets the stage for what is to follow. It is like a program given to a viewer at the theater. The body of the outline that follows should support the argument identified in the introduction. The body of the essay is the most important part and, as the outline shows, a lot of time should be given to developing it. The more time you give to developing your outline, the easier and quicker it will be to do the actual writing. A persuasive essay differs from an argumentative essay in that the latter is based primarily on using evidence and facts to make a case. A persuasive essay can use whatever is handy to persuade the reader. This means that evidence and logic are not necessarily the most important tools needed for a persuasive essay; instead, the writer can make appeals to emotion, can use stories or anecdotes, and can use various rhetorical devices to win the reader’s mind and heart. a. Hook the audience with a bold claim or assertion. The narrative essay is like a story: it is more creative than either an argumentative essay or a persuasive essay. It is often personal or anecdotal and includes a focus on people, places and events. a. Have a purpose in mind: if there is no purpose to your narration, why have one at all? b. Adopt a clear point of view: 1st person POV is acceptable. c. Give the reader an idea of where the essay is heading. a. Paragraphs can be more detail-oriented and focused on setting a scene, establishing mood, or describing an action. b. Each paragraph should move the action of the narrative along in some way. c. The progression of action should include an end-point. a. A summation of the feelings experienced. b. A sense of closure for the reader. c. A quick re-cap of how events progressed can also be included but is not necessary. The 5 paragraph essay outline is the most basic outline that a writer can use. 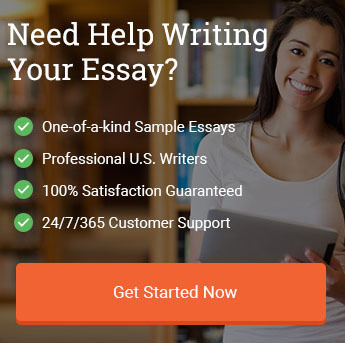 It works for any type of essay and can be easily and quickly created. a. Introduce the main idea of the paper. b. State your thesis at the end of the first paragraph. i. One paragraph for each supporting point. ii. Each paragraph should stand on its own. b. Show how each paragraph relates to the main idea of the paper. c. Use transitions from one paragraph to the next so that paper flows smoothly and proceeds logically. a. Re-state the main idea of the paper. b. Remind the reader of how the idea is supported by the three points illustrated in the body of the paragraph. The compare and contrast essay allows the writer to take two subjects and identify similarities and differences between them. a. Identify the two subjects you will compare and contrast. b. State the objective in comparing and contrasting these two subjects: why are you doing it? What is the purpose? c. Indicate whether a theme or main idea is made apparent through this exercise. a. The body can be arranged in various ways. i. You may designate a paragraph to a topic and show in that paragraph how the two subjects are the same or different with respect to the topic. ii. Or you may designate a paragraph to a description of one of the subjects and use the following paragraph to compare the other subject. Do the same for contrasting (showing the differences). b. Transitions should be used and references to a theme or overriding idea made in order to give the body a cohesive flow. a. Summarize the similarities and differences. b. Re-state the significance of comparing and contrasting the two subjects, i.e., what the point of the exercise was. The informative essay is a mix between the expository essay and the descriptive essay. Like the expository essay, it should include a little research and some facts; like the descriptive essay, it should explain the subject and provide details. The informative essay does not need to argue anything: it is all about simply getting the facts out to the reader. For that reason, it is a fairly straight-forward type of essay. a. Tell the reader what you will inform them of. b. Explain how you will do it. c. Indicate whether there is a theme to be observed. a. Follow a logical progression. b. If you are informing of an historical event, use chronological order. c. If you are informing them of a particular phenomenon, break it up into thematic categories. a. Summarize the main aspects of the subject. b. Remind the reader of the theme that is to be understood (if one is identified). If you examine the above examples, you will notice a basic essay outline template common to them all. Even though each is different in its own way because of the nature of the essay for which it is designed, the basic formula is the same. Let’s have a look at how this might play out in real terms. Study the following essay outline examples—one for each of the essay types discussed above. a. Context: The current economic climate is very volatile, considering the various political, social and financial issues that face not just the U.S. but the entire globe. b. In such a climate it is critical that individuals assess the best way to save their money and keep it from being devalued. c. Gold and silver are precious metals (PM’s) that represent alternative investments for savers because they keep track with inflation, require zero maintenance, and are still relatively inexpensive when compared to other asset prices. a. Gold and silver keep track with inflation. i. They do not lose value over time but, when priced in USD, reflect the value of the dollar in their own exchange rate/spot price. iii. It is also smart investment because if the stock market tanks, PM’s will be viewed as a safe haven and their price will go up. c. Some will argue that PM’s are so expensive—but when compared to other assets (stocks, bonds, real estate) it is evident that PM’s are still undervalued. a. Investing in gold and silver in a market climate that is unstable is a wise idea. b. Your money will be safe in PM’s because they keep track with inflation. c. It is a very liquid market and requires no maintenance. d. And if equities go south, PM’s will even rise in value. a. Okay, so you may not feel cool when riding in your car with your seatbelt on—fine! b. But riding in a car is not about being cool—it’s about getting from point A to point B safely—and that’s it. c. For new drivers, there is a lot of pressure to show off when on the road, to demonstrate your skills to others. d. But new drivers should be smart: the best way to show off is to be safe—and that means wearing a seat belt. e. The purpose of this paper is to persuade new drivers that they should wear their seat belts whenever they are in a car. a. Don’t try to be cool—just be safe. i. Trying to be cool is silly. 1. You can be slick one minute and in a crash the next. 2. Better to be safe and wear your seat belt. ii. Being cool won’t save your life—but a seat belt will, so put it on. b. The best way to demonstrate driving ability is to follow the rules and buckle up. i. Driving is for mature people—not immature people. ii. Mature people wear their seat belts because they know what can happen if they don’t. c. Wearing a seat belt is the law in most places, so obey the law. i. Why risk getting a ticket and paying a fine? ii. If you don’t wear your seat belt, your driving record could suffer, and that could come back to haunt you. a. Wearing a seat belt will keep you safe, show you’re responsible, and help you maintain a blemish-free driving record. b. So be safe and buckle up! a. Going to college is an adventure—and nothing compares to the first day on campus. b. I remember my first day of college: everything was new, big, and not a little frightening. c. In this essay, I will describe what it was like for me on my first day at university. a. I woke, ate breakfast, got my books in order for the schedule of classes that day, put on my best clothes, hopped in the car and headed to campus: I was upbeat and excited. b. However, when I got there, there was a ton of traffic: it was almost like the entire county was trying to find a parking spot. c. It took me an hour to park and I still had a long walk just to get to my building. My good mood was gone. ii. I was late to every single one. d. All my teachers seemed to be expecting a lot from us. I thought college was supposed to be fun! e. I looked at all the syllabi I received that day and felt like college sure was going to be a lot of work. a. I felt many emotions that day—from excitement to fear to frustration to disappointment. b. However, I quickly adjusted to my life at college and got used to all the different experiences. a. Everyone’s heard the phrase, “That’s like comparing apples and oranges”—but has anyone ever stopped to do that? b. It is actually a rather interesting idiom to examine: how closely related are apples and oranges? c. This paper will compare and contrast apples and oranges and show that while they are different, they really have a lot more in common than they are given credit for! i. Apples are mostly red—but not always: there are green apples, yellow apples, yellow-red apples, and so on. Oranges are one color—orange. ii. Apples are good in pies. Oranges are good in marmalade. iii. Apples are crisp. Oranges are juicy. iv. Apples can be sweet, tart and bitter. Oranges are usually sweet. i. Apples make great cider. Oranges can be used to flavor beer. ii. Both are fruits and can be used for fruit juice. iii. Both grow on trees. iv. Both are good for you. v. Both are commonly found in one’s fridge. vii. Many people love both apples and oranges. a. Apples and oranges may look different and have different uses in baking, but they are both good, good for you, have seeds, are commonly found in one’s home, and are loved by many. b. So when you hear someone say that apples and oranges are way different from one another, you can let that person know that the two fruits actually have a lot in common, too! a. How to make coffee at the start of the day. c. Follow directions precisely, and your brew will never go wrong. a. Fill the coffee pot with water to the top cup line (12 cups in a standard pot). b. Pour the water into the coffee maker reservoir. c. Set the pot on the hot plate. d. Empty any old coffee grinds in the maker. e. Put a new filter in. f. Get out fresh coffee grinds. g. Put as many rounded teaspoonfuls of coffee grinds into the filter as cups of water were poured into the maker. (If 12 cups of water, 12 rounded spoonfuls). i. Hit the brew button. a. The key to great coffee is having the appropriate amount of coffee grinds to water. b. Your coffee will be neither too weak nor too strong. Use an essay outline whenever you’re tasked with writing an essay. 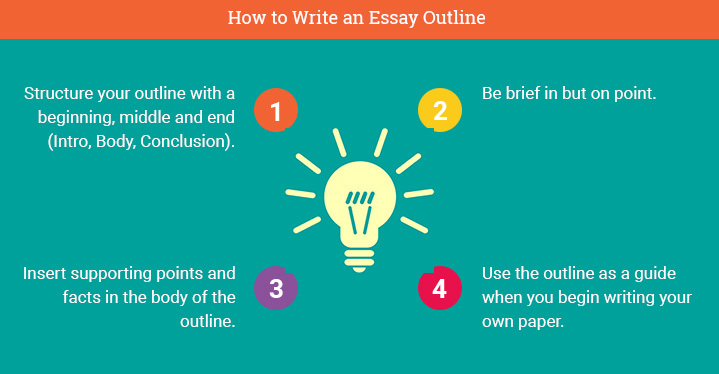 The outline is there to help you guide your essay to success. Use its structure to ensure that your writing is on-topic and focused. Use the examples above to help write your own! 1. Structure your outline with a beginning, middle and end (Intro, Body, Conclusion). 2. Be brief in but on point. 3. Insert supporting points and facts in the body of the outline. 4. Use the outline as a guide when you begin writing your own paper. "How to Write an Essay Outline (professor approved)." Aceyourpaper.com. Student Network Resources Inc, 28 August. 2017. Web. 18 April 2019. Student Network Resources Inc. "How to Write an Essay Outline (professor approved)." Aceyourpaper.com. https://www.aceyourpaper.com/essay-writing/essay-outline/ (accessed April 18, 2019).